Primatech 250A – Adjustable Base Version | Hy-Cor International Inc. 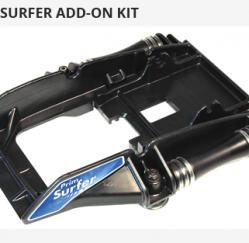 Available in three configurations: S (stapler) L (“L” cleats) or T (“T” cleats). Model 250AL Nailer shown. 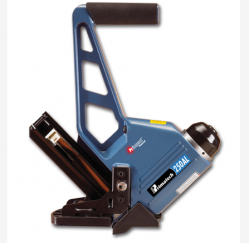 The 250A’s articulated, dual action and fully adjustable base which enables it to deal with an infinite variety of solid/engineered flooring from 5/8″ to 7/8″ (16 to 22mm). Once set on the board, the foot of the tool rests firmly against the tip of the tongue to keep the tool in position and prevent damaging the top finish. The cam operated base plate adjuster maintains a consistent angle of penetration to deliver the fastener snugly into the nail pocket of the board with controlled penetration and perfect accuracy.